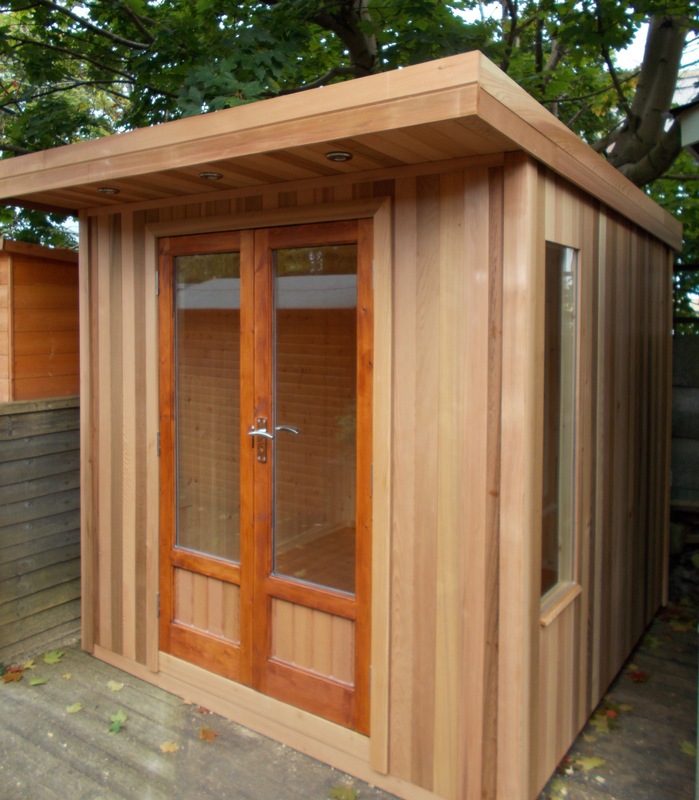 From Western Red Cedar buildings to Home Offices and Hot Tub buildings we make every type of Summer House to enhance your garden. 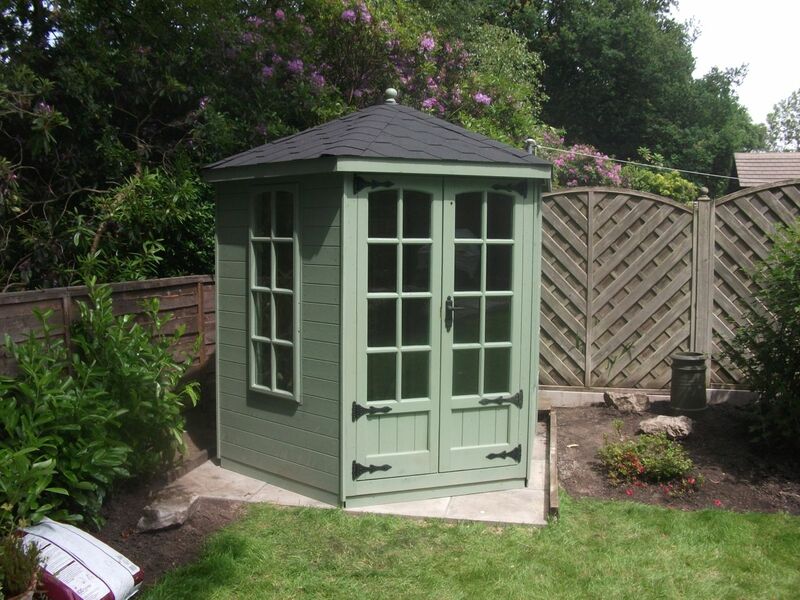 Contemporary buildings painted in a full range of shades to help make any garden look stunning. 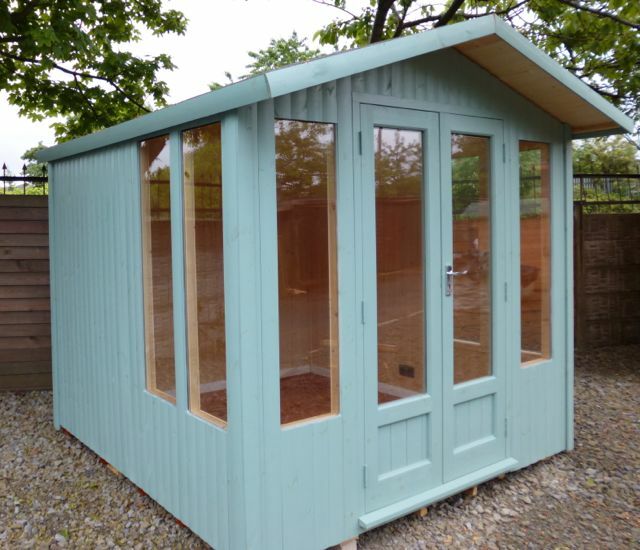 Save your self a fortune and get a better product, we are around 1/3rd cheaper on our Painted Contemporary lined buildings than Dobbies and Bents Garden Centers. 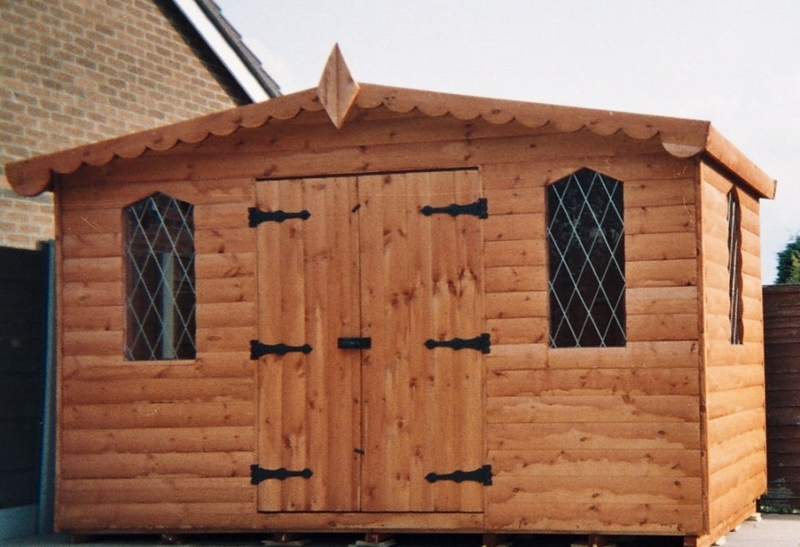 because you buy DIRECT from a quality manufacturer. 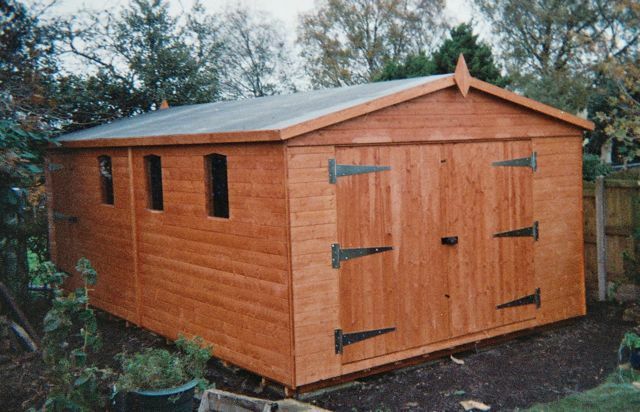 British TREBBLE galvanised nails don't. 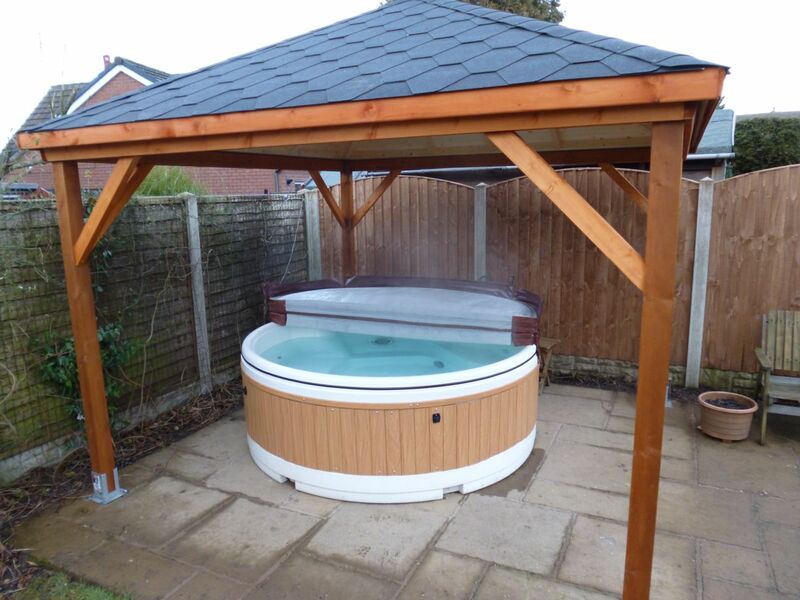 British roof felt is £45 roll..... guess which one works ? 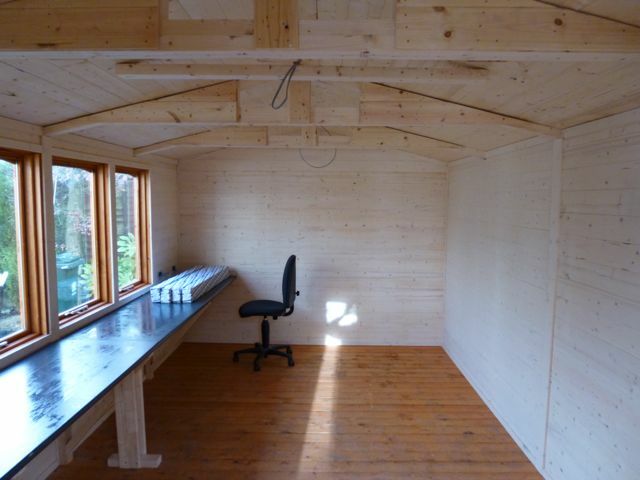 ALL ASSEMBLY WORK IS DONE BY OUR OWN JOINERS. 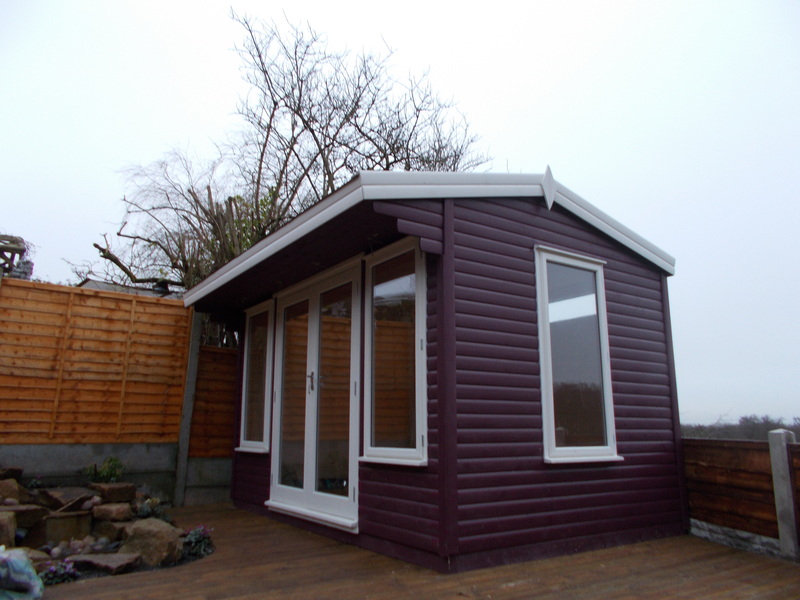 ( most use interior cladding under the felt ) ... WE DON'T... this is why our felt doesn't come off in the wind ! 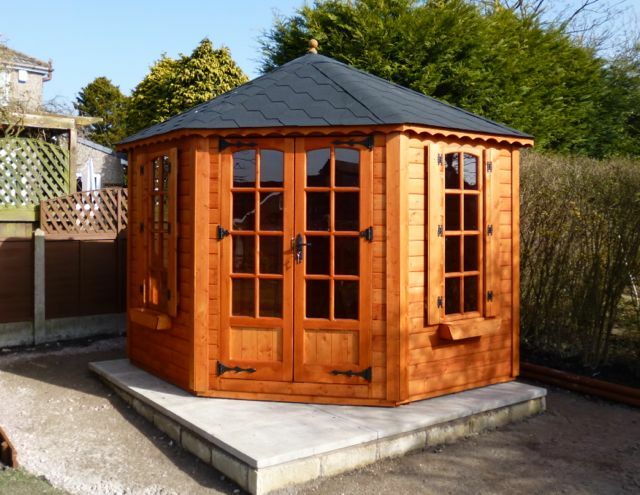 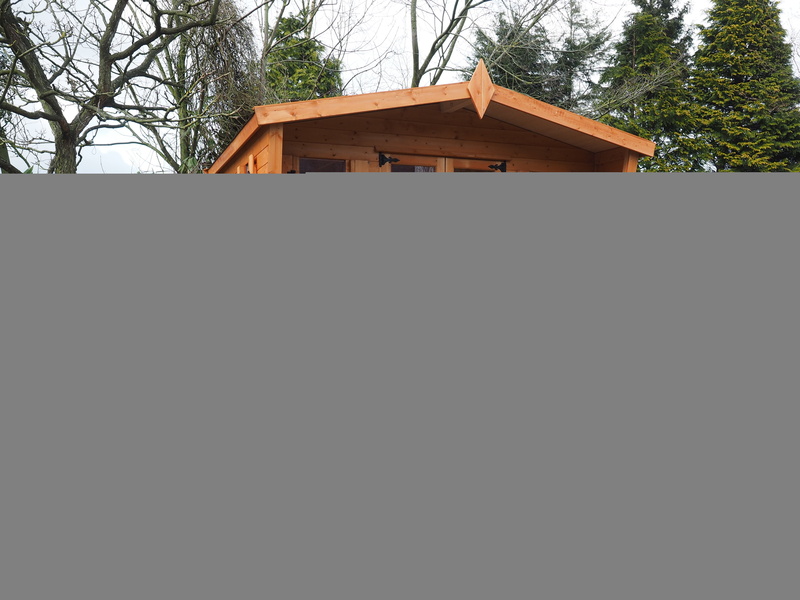 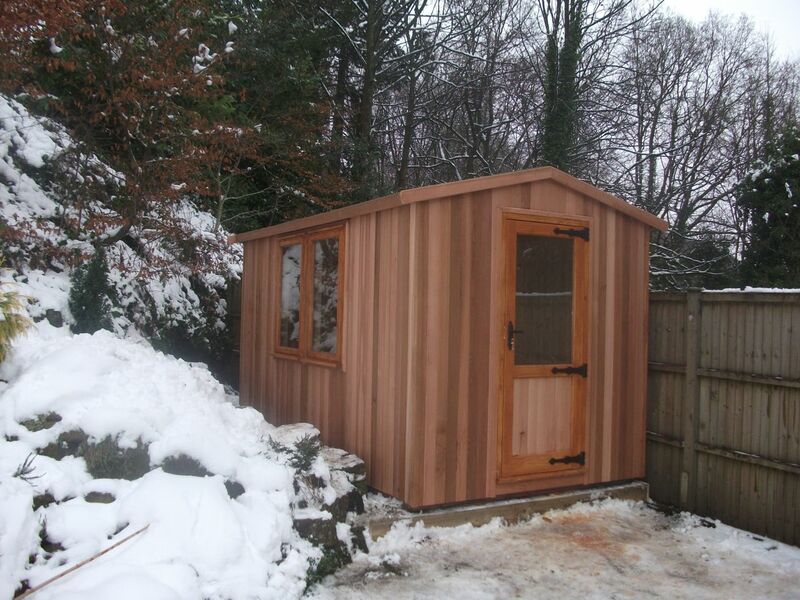 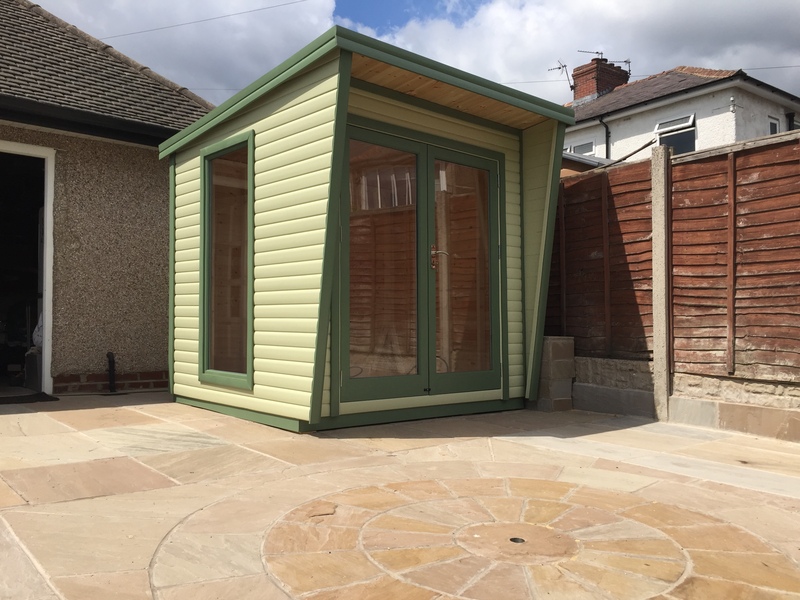 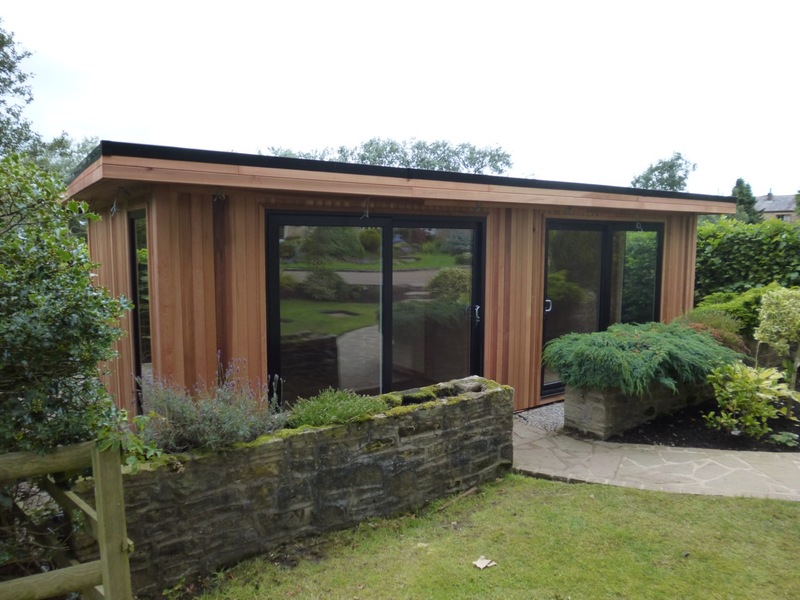 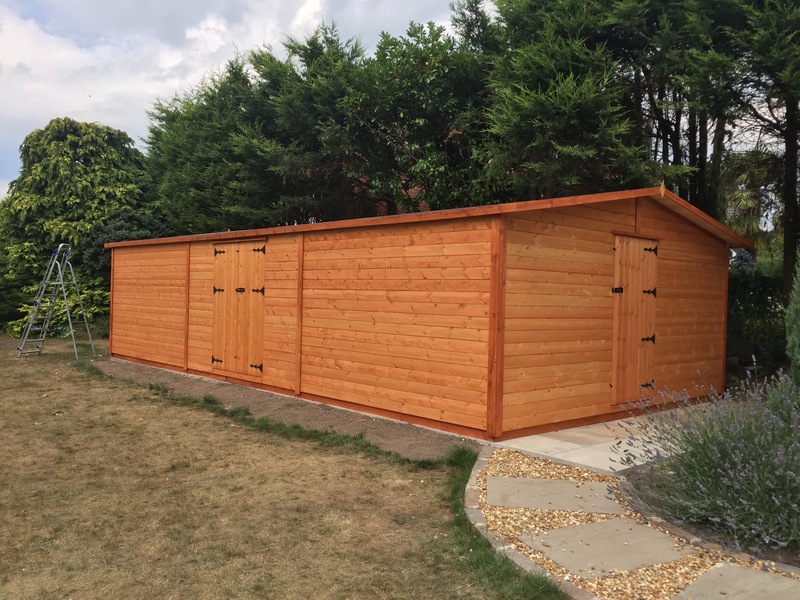 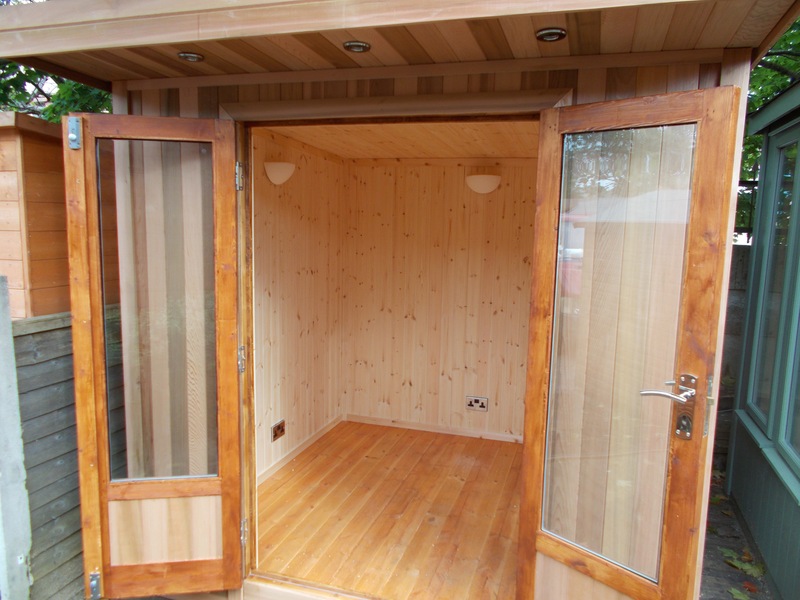 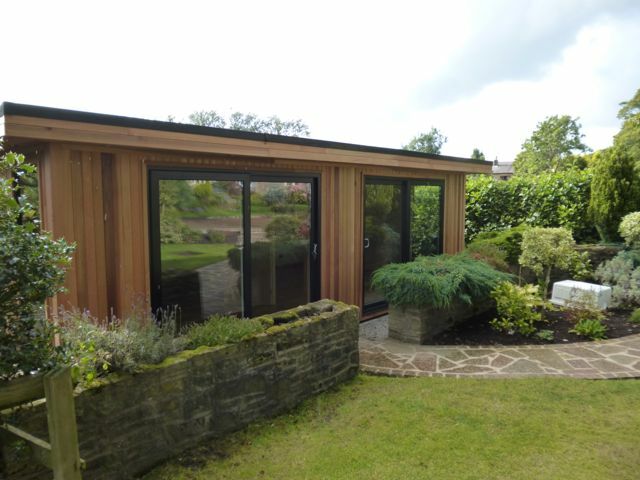 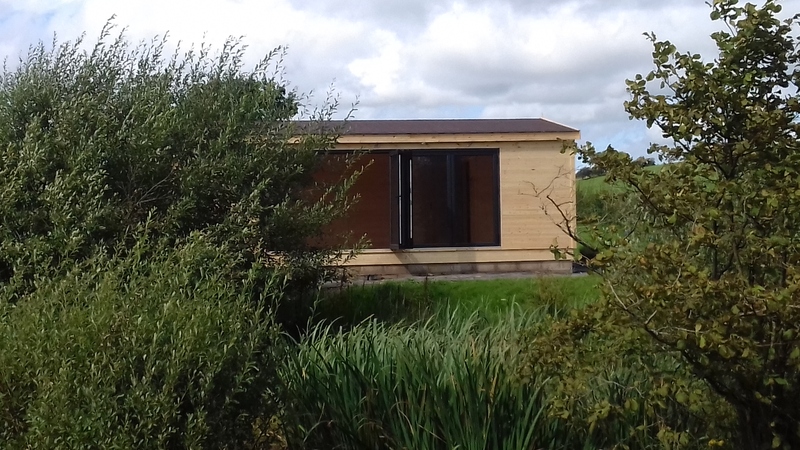 Here at Lancashire SummerHouses we specialize in Western Red Cedar Workshops, Clear Grade Western Red Cedar Garden Rooms and Summer Houses, and Western Red Cedar Garden Sheds, We 'secret nail' all our Cedar buildings for that 'perfect look'. 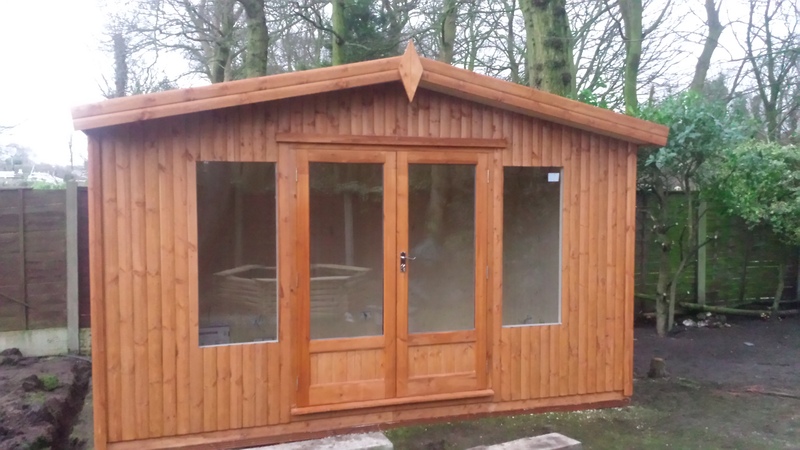 esquisite timber available today for building manufacture, so if it's quality your after come and have a look, you will be staggered at the quality, surprised at our prices, and pleased with our service. 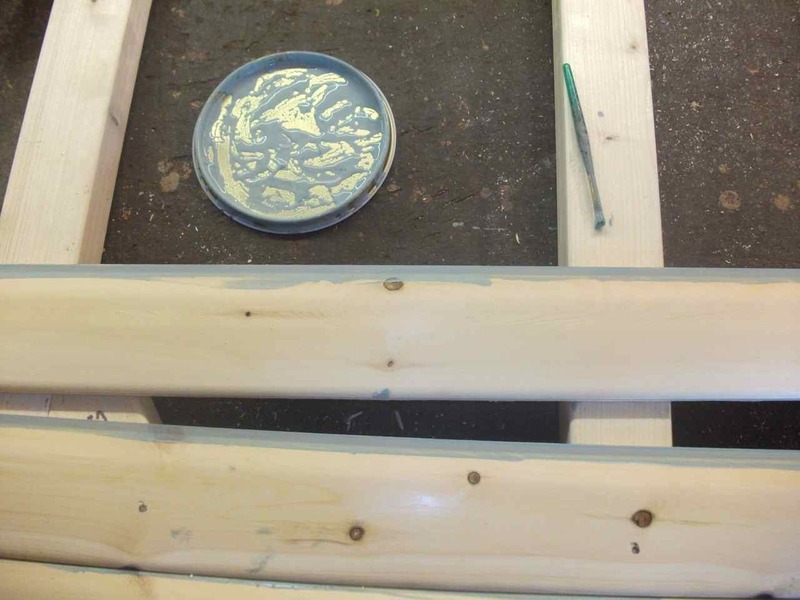 YES WE EVEN PAINT TONGUES! 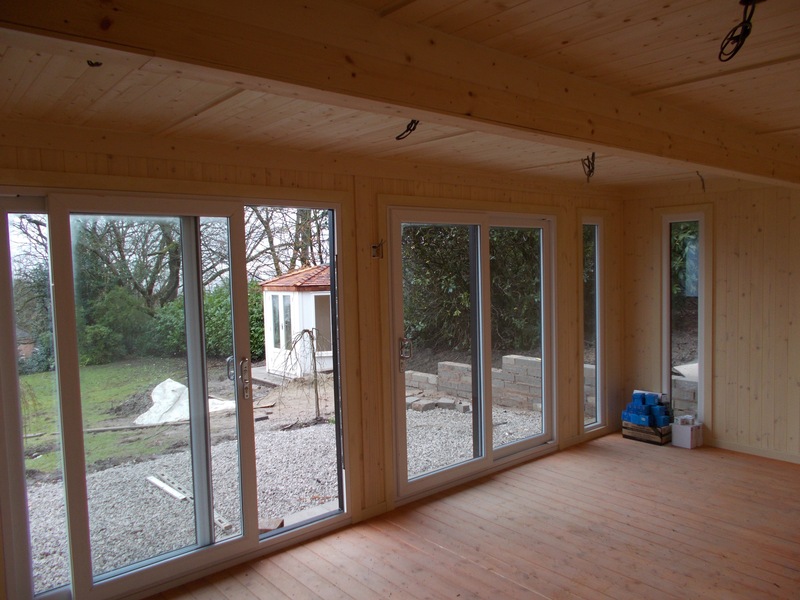 If the timber moves you wont see ugly white lines! 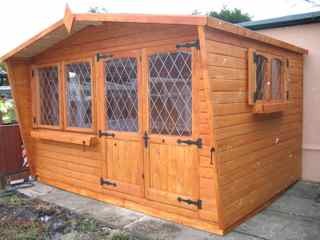 at great prices and animal housing! 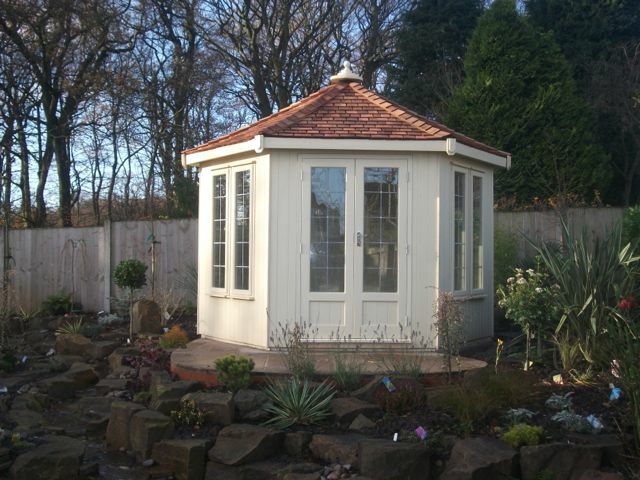 Delivering quality Summerhouses ,Summer houses to Lancashire. 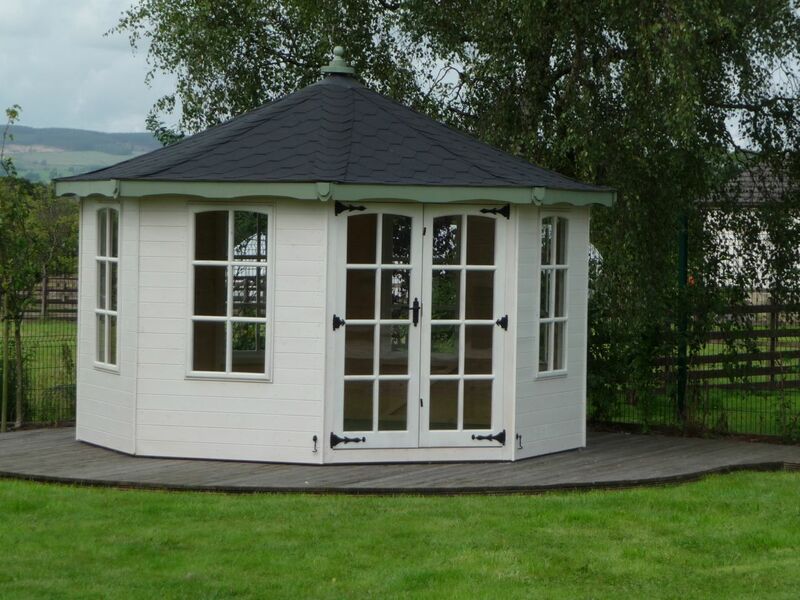 Contemporary Summerhouses, Quality Summerhouse ,summerhouses for sale in Lancashire, wooden garden summer house, wooden garden houses, garden offices and garden office, insulated garden studio, cheap summer house and summerhouses small summer house, summer house uk, garden studio uk, insulated garden studio uk, pods, garden pods, pods uk, home and garden, wooden summerhouse uk, uk pods made, cedar summer houses manufactured, cedar summer houses for sale, cedar studio's for sale, dog house and dog houses, shed cabin combinations, Garden Gazebos, Gazebo's, painted wood buildings, painted summer houses, garden cabins, storage sheds and tough sheds, gazebos uk. 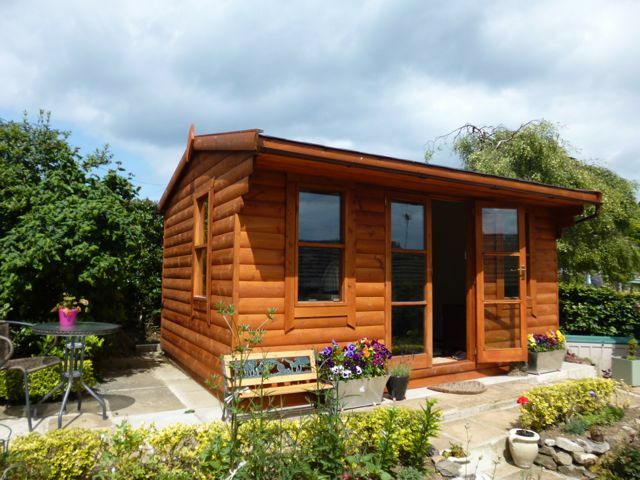 studios for sale in Blackburn, Lancashire. 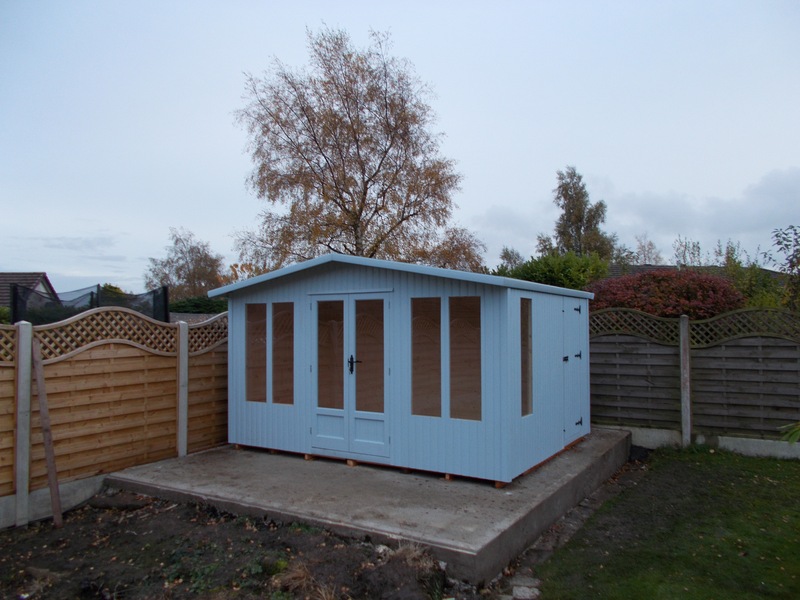 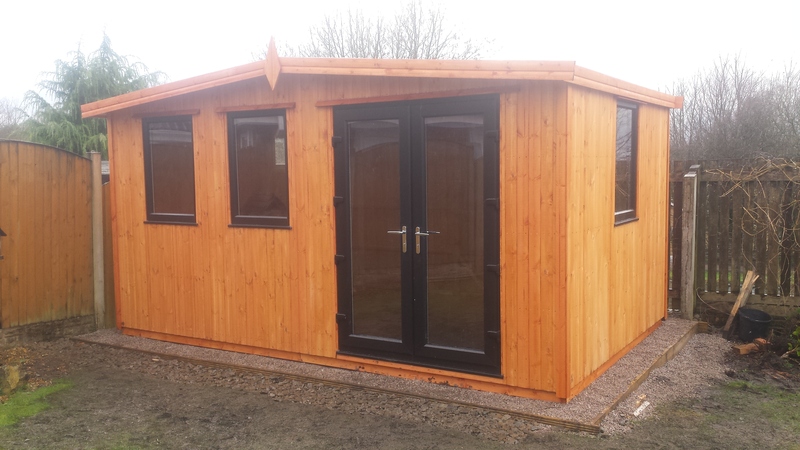 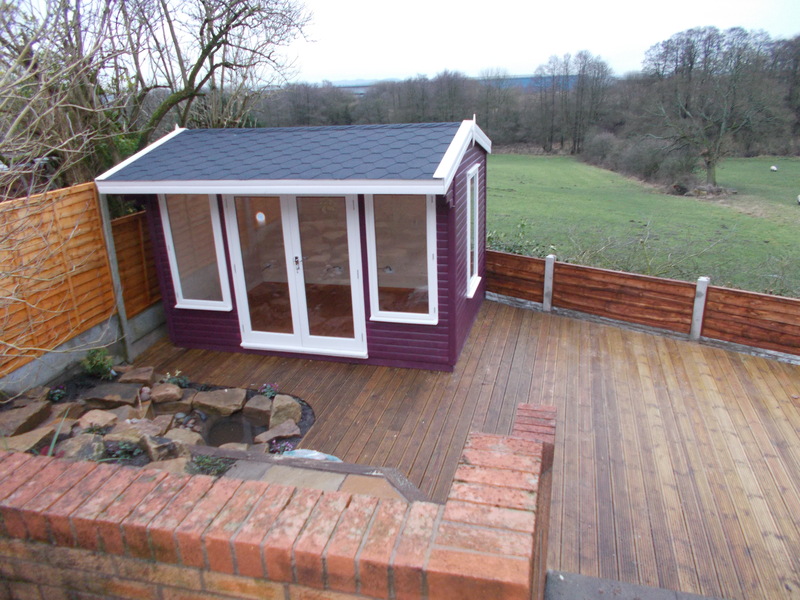 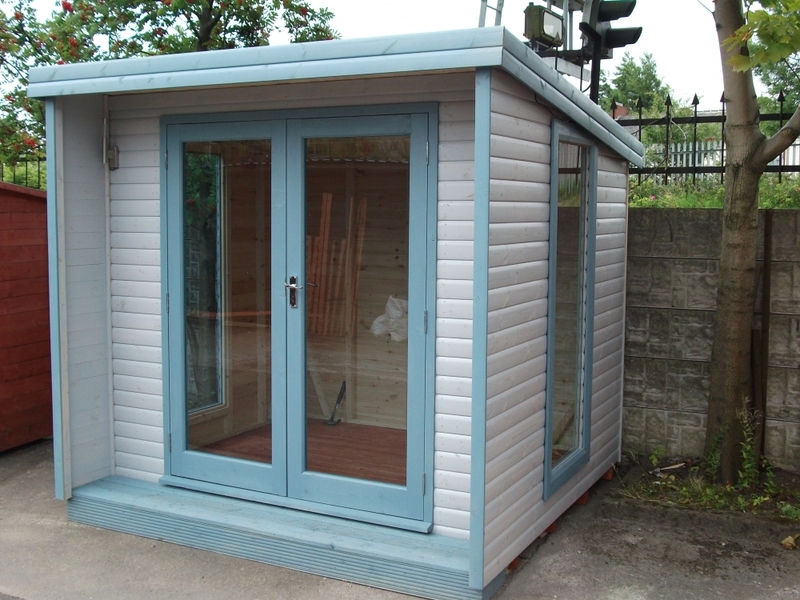 We do shed install, summerhouse install, studio install, our qualified staff install our buildings no one else. 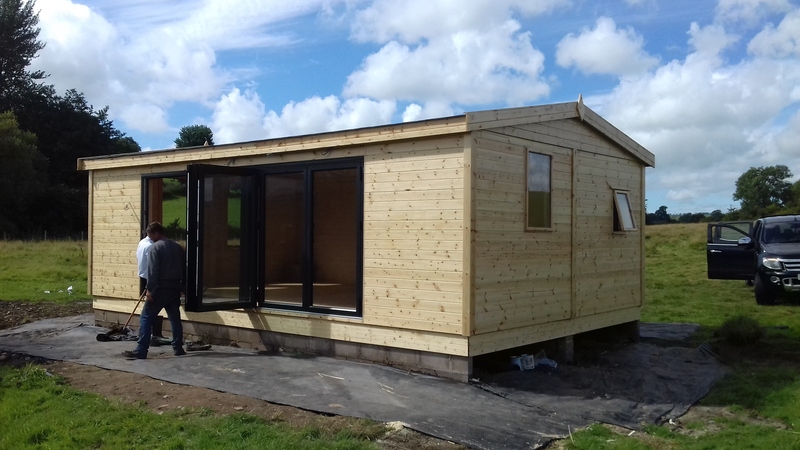 We take a deposit and bespoke build your building to your exact requirements on all buildings over £2,000 full payment is required 7 days prior to delivery. 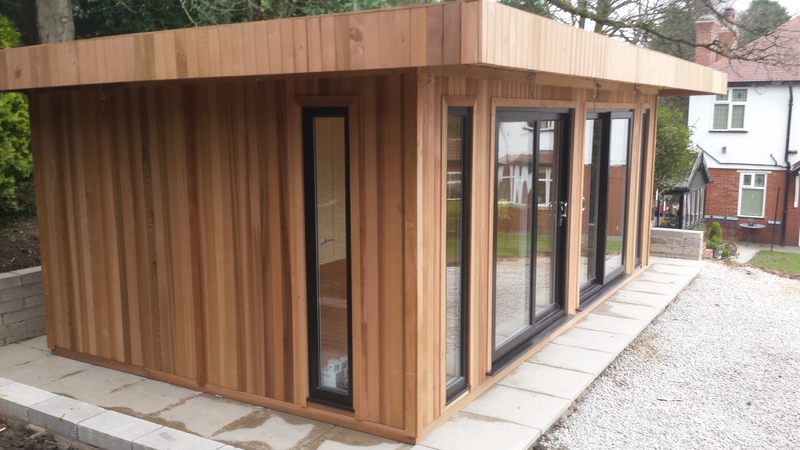 95% OF ALL OUR HINGES ARE MADE WITHIN ONE MILE OF OUR WORKS, THEY WERE DESIGNED BY OUR MD RUSSELL AND ARE SUPPLIED NATIONWIDE. 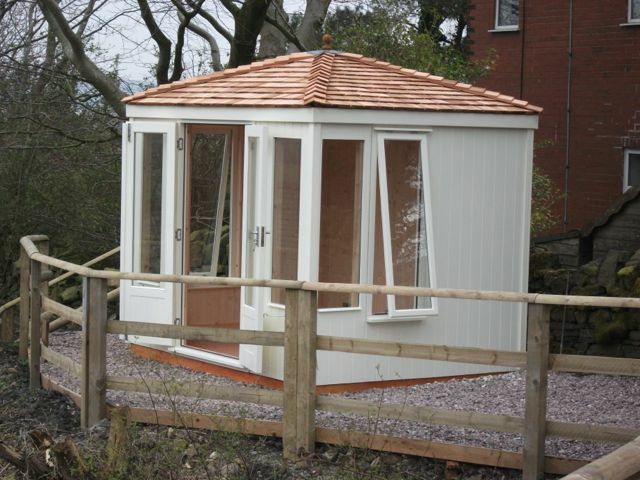 AS WE BELIEVE THESE ARE THE BEST AVAILABLE! 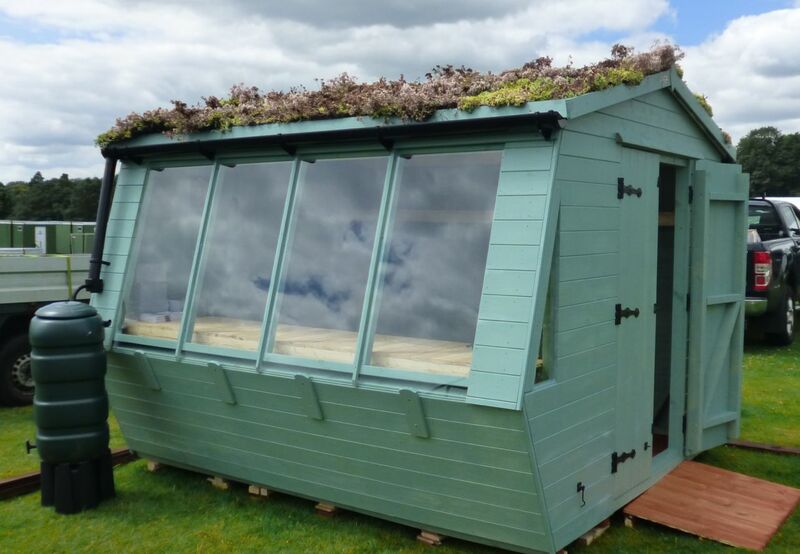 ALWAYS WHERE POSSIBLE WE WILL ENDEVOUR TO PURCHASE BRITISH MADE GOODS. 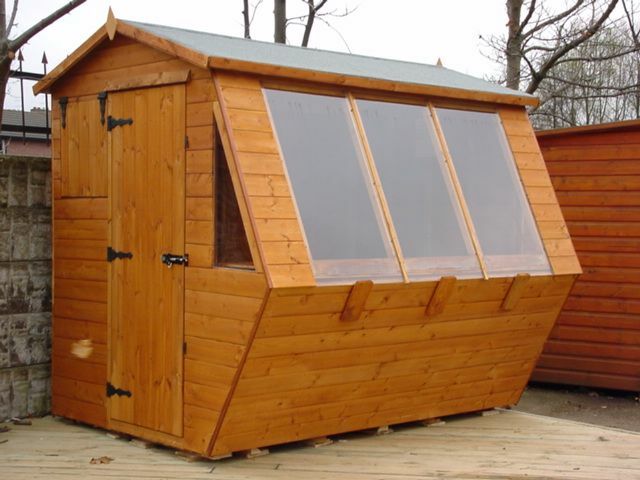 BADBOLT ......... 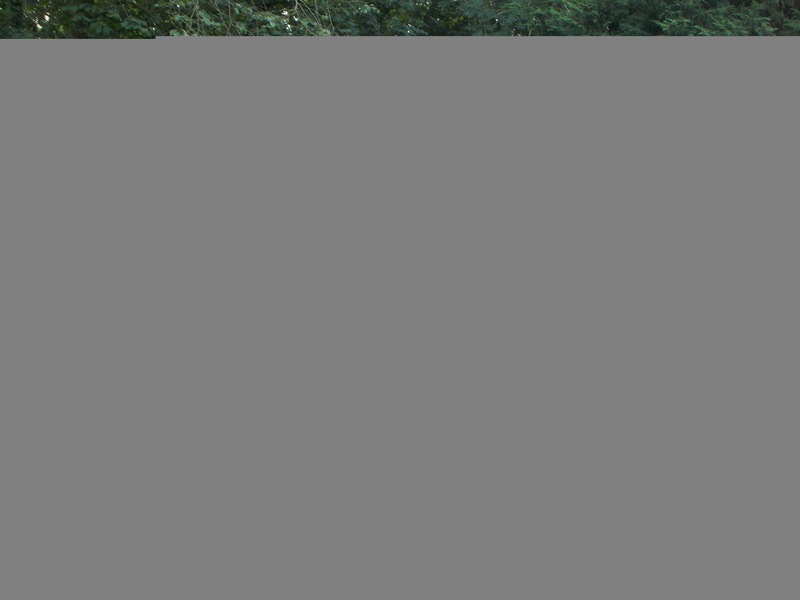 THE SEARCH CONTINUES! 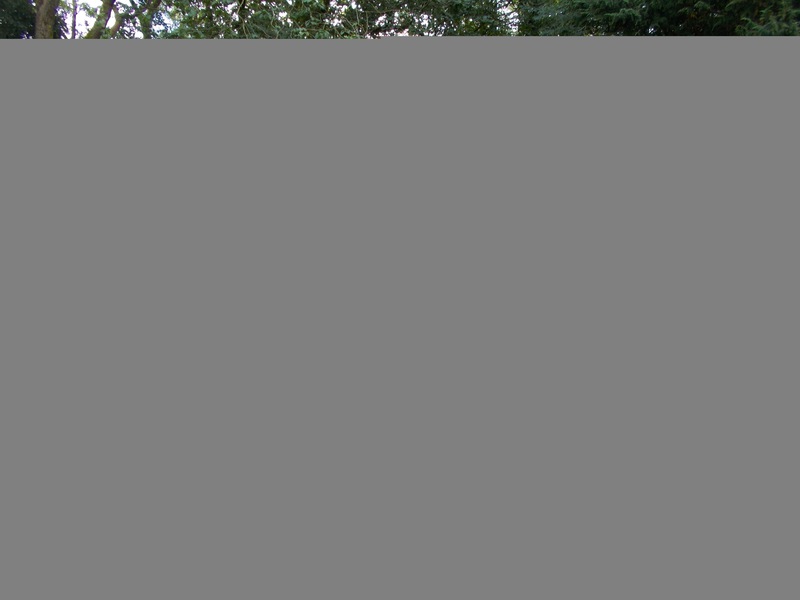 Take the iphone it is in fact excellent. 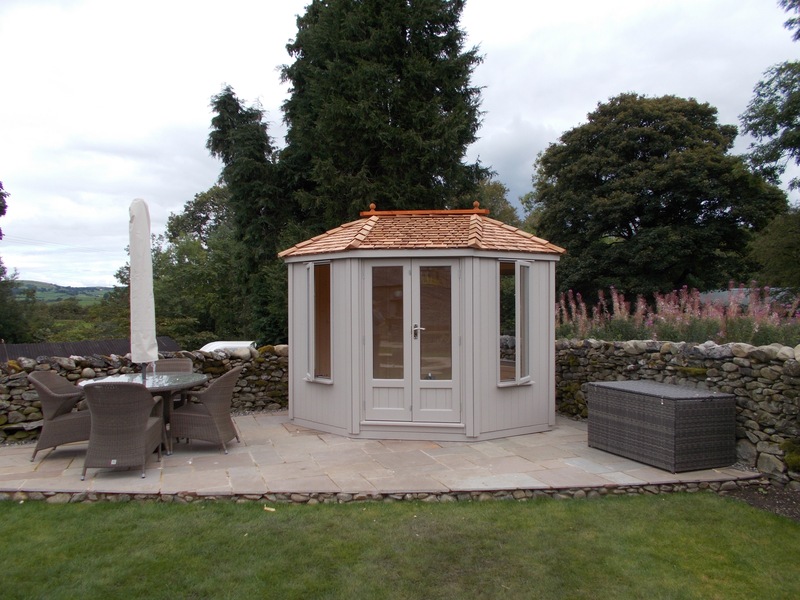 Whilst we are LANCASHIRE SUMMERHOUSES and most of our work comes from Lancashire we are increasingly being asked to deliver and assemble our buildings further afield, this year alone we have done work thoughout Cumbria, Manchester, Liverpool, Birmingham and as far away as Sussex so anything is possible! 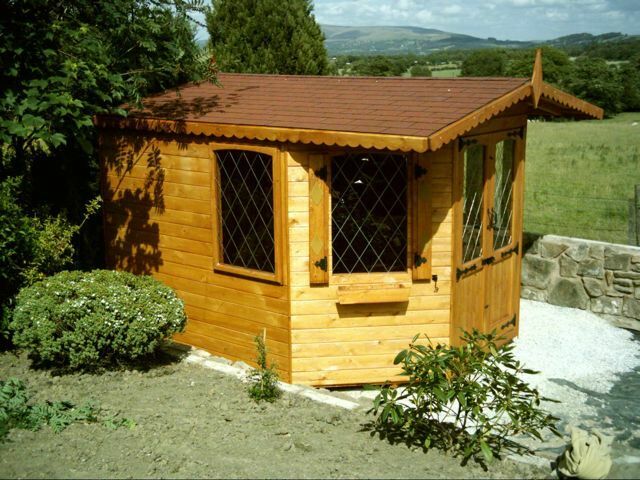 JUST A SMALL SAMPLE OF WHAT WE MANUFACTURE. 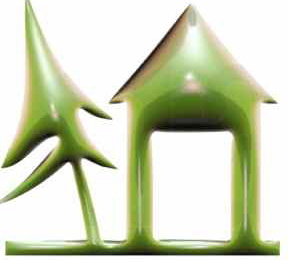 We are here to make the best..... 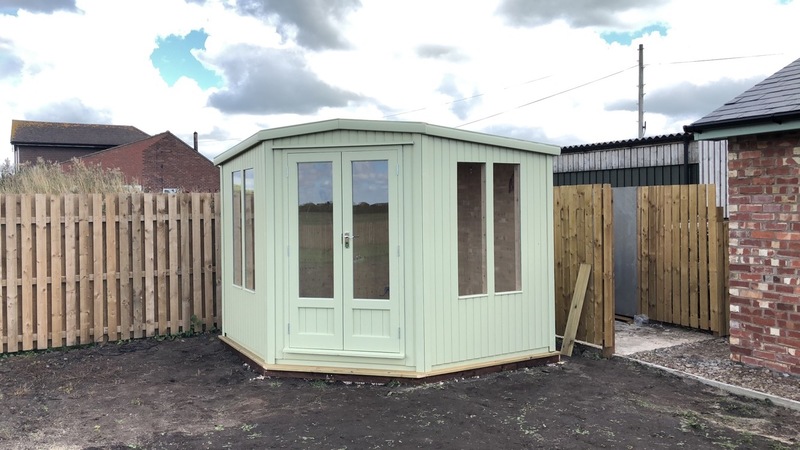 But at Lancashire prices not London prices...Quality Summerhouses for sale, Quality Sheds for sale, Quality Home Offices for sale, all made to be SOLID,LEVEL AND DRY and give years and years of service for you to enjoy. 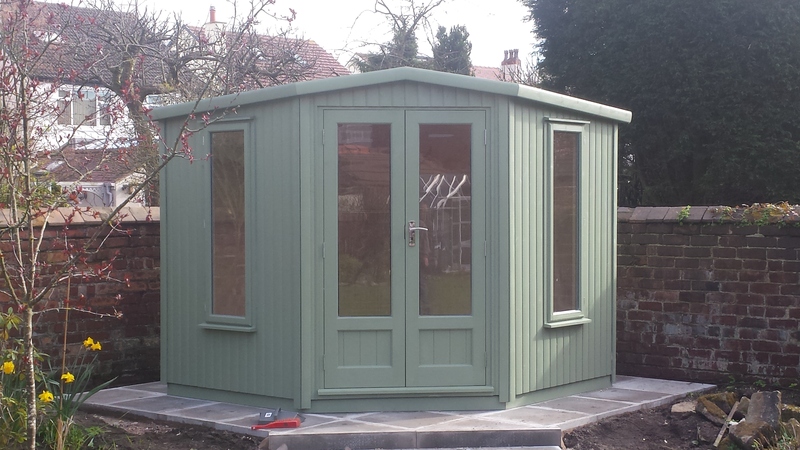 throughout lancashire and surrounding districts. 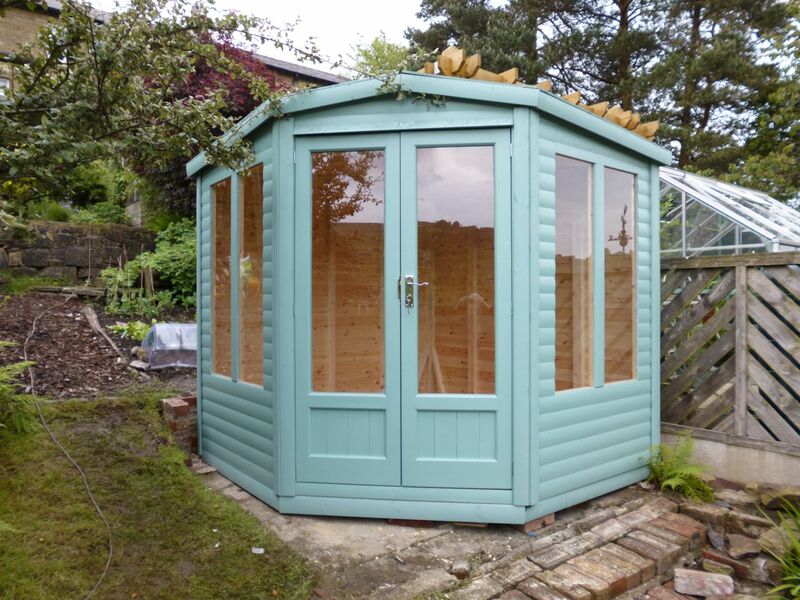 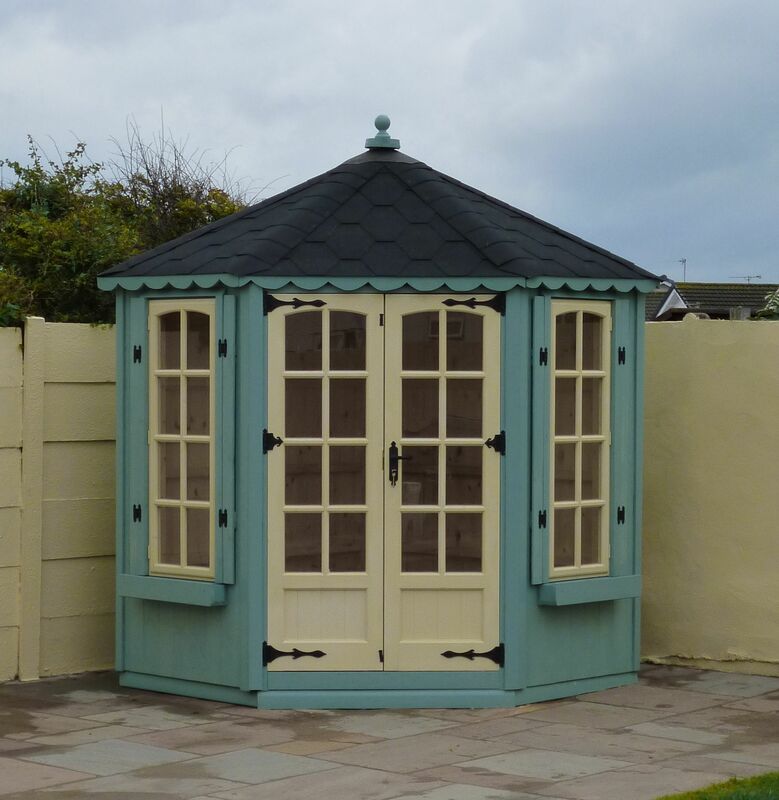 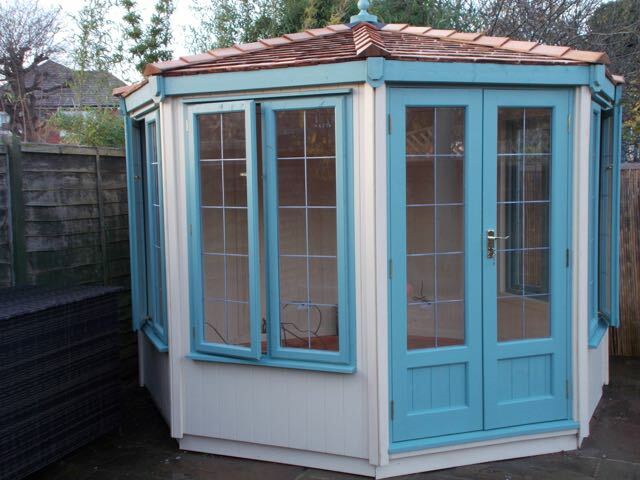 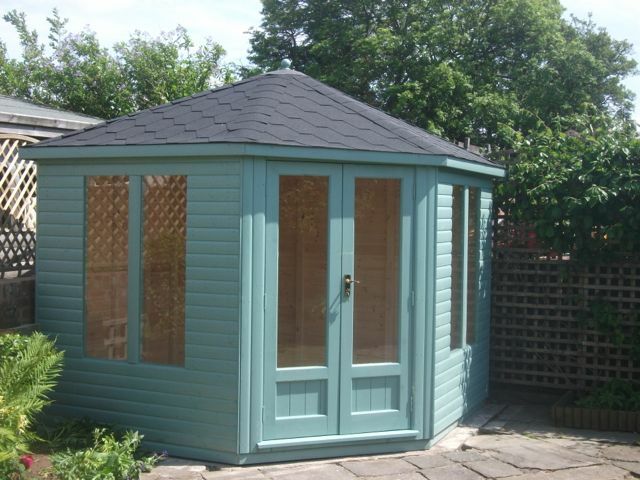 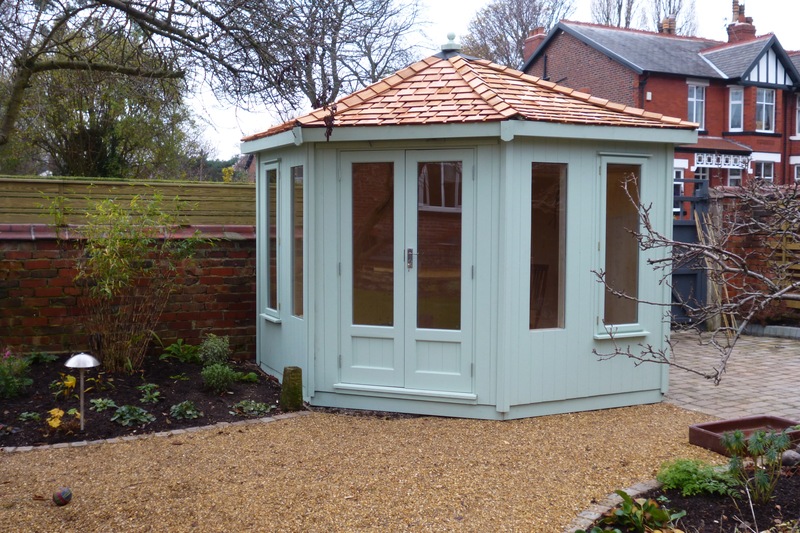 Contemporary Sea Green painted Corner Summerhouse with a felt tiled Vaulted Cathederal Roof. 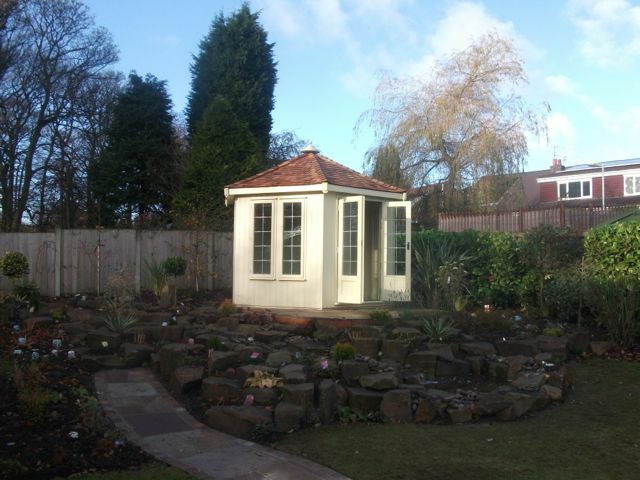 Can be see at Sandy Lane Gardening Group Display at TATTON. 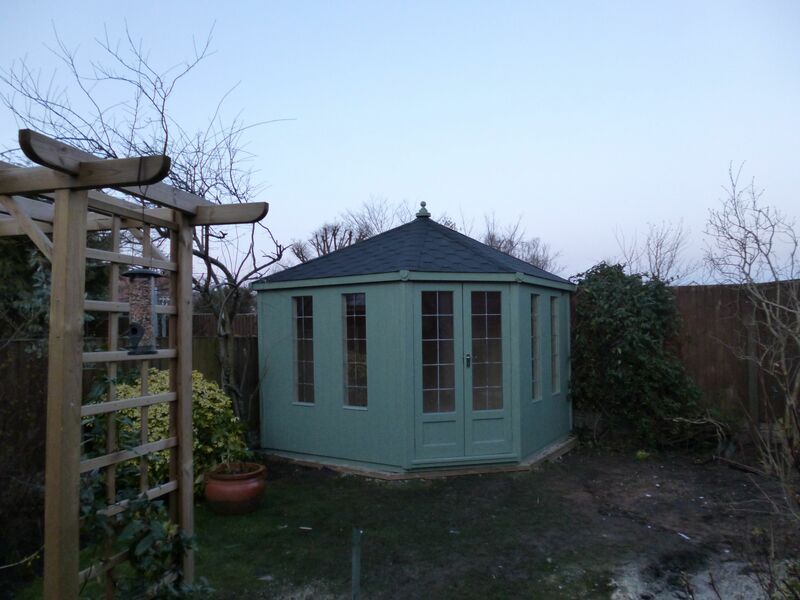 Contemporary Summerhouse in Sea Green colour fully lined and insulated, with electrics pack and edpm one piece rubber roof. 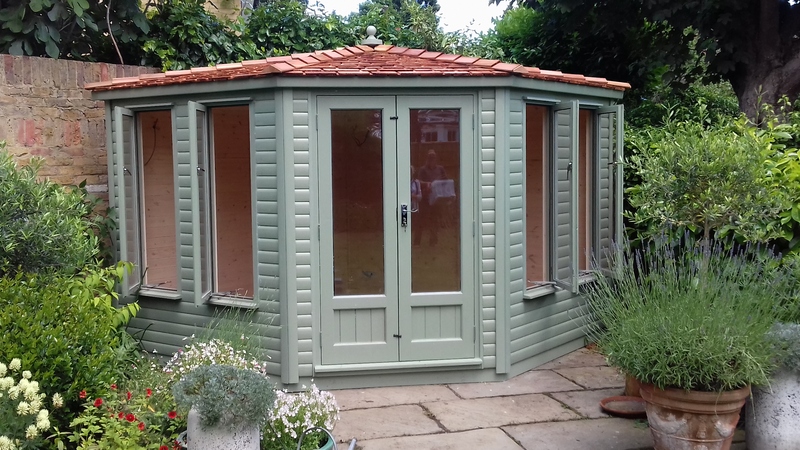 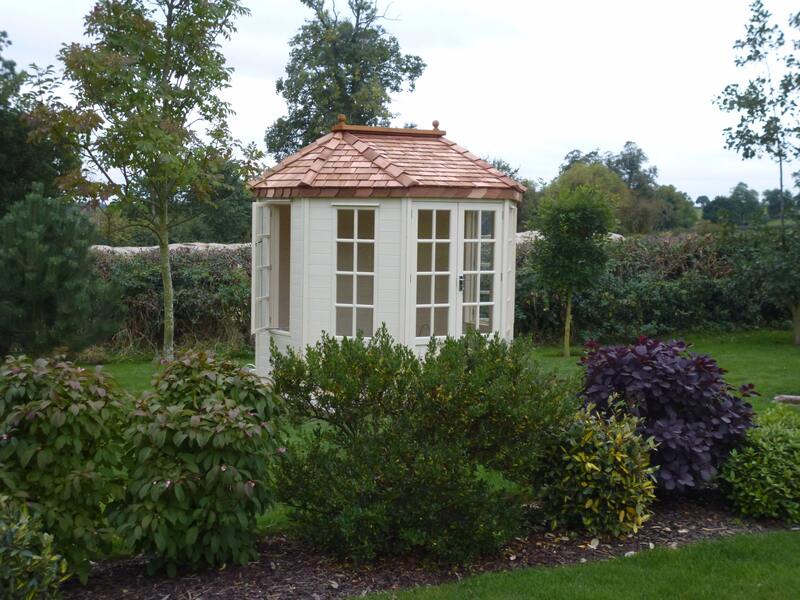 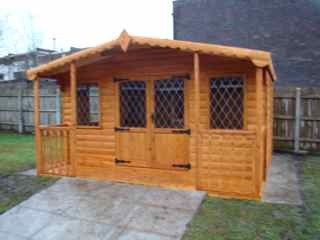 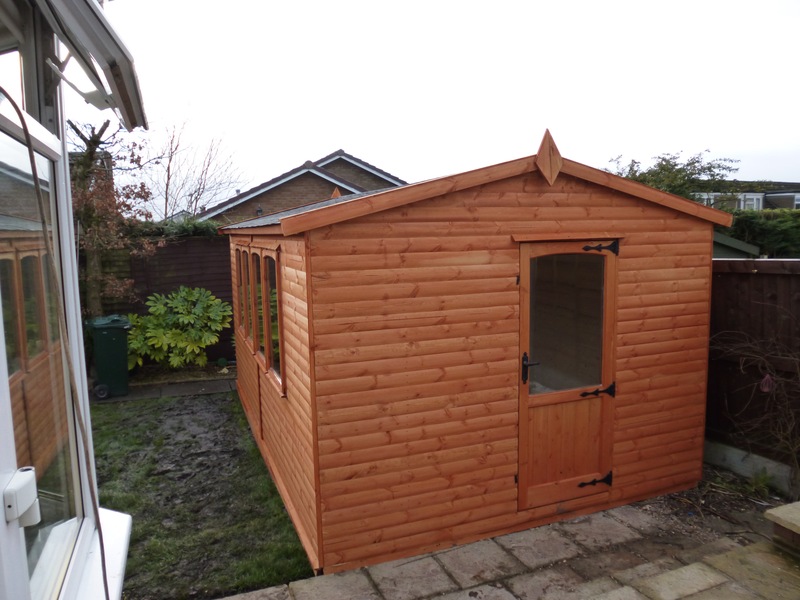 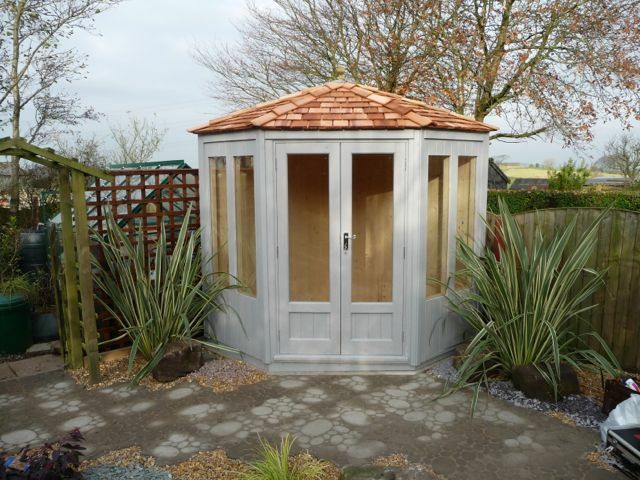 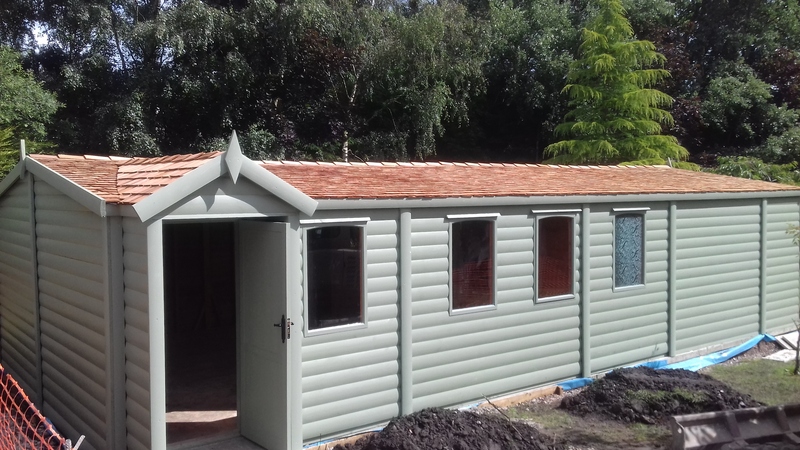 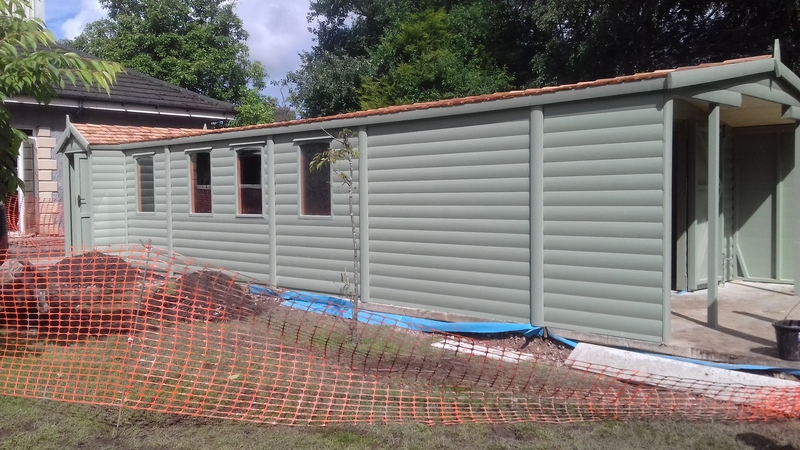 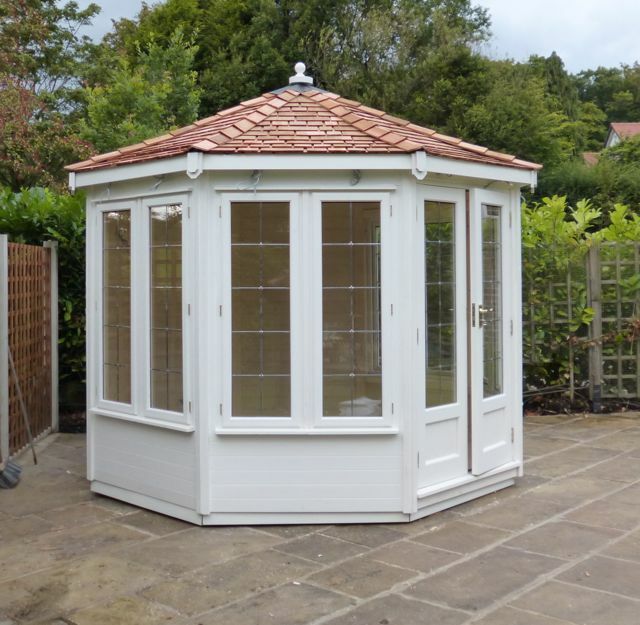 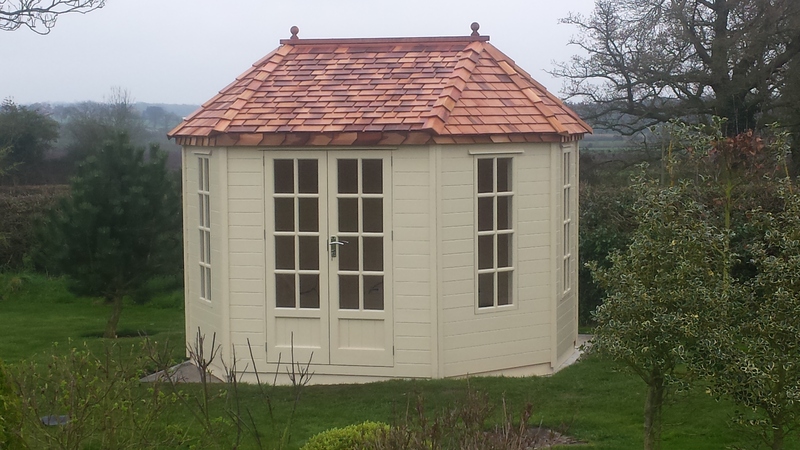 10' X 10' LONG ISLAND OCTAGANAL CEDAR CLAD GAZEBO PAINTED IN JASMIN FULLY LINED AND INSULATED WITH ELECTRICS INCLUDING A CEDAR SHINGLE ROOF AND FOUR EXTRA WINDOWS MAKING THIS SUMMERHOUSE A DELIGHTFULLY LIGHT BUILDING TO BE IN PRE WIRED ELECTRICS FOR SOFFIT LIGHTS . 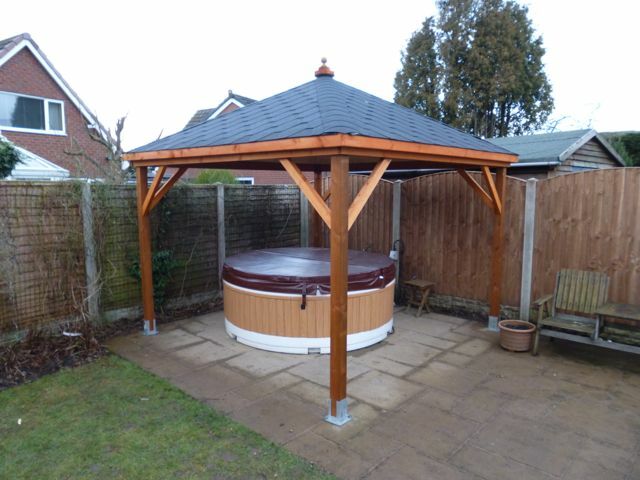 UP DONE AND READY TO USE IN THREE DAYS! 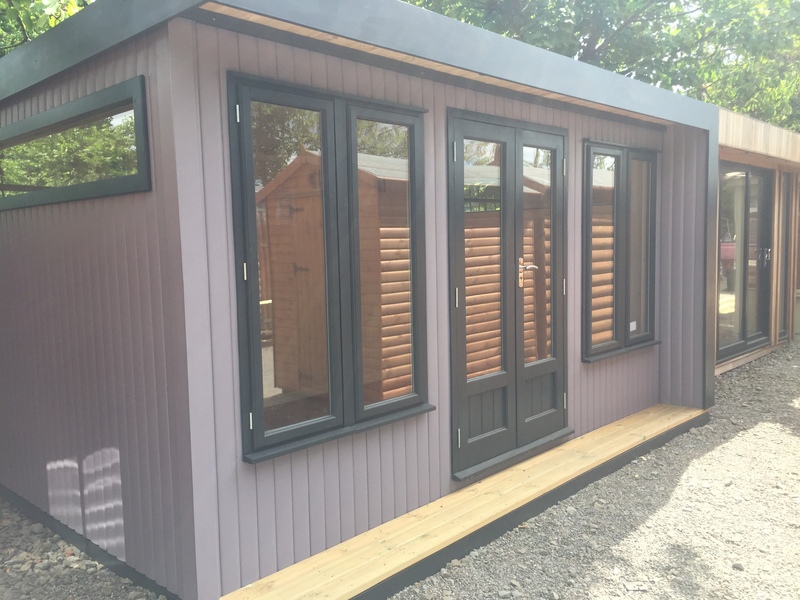 fitted out with all painted arcs and skirts, brass door handles, brass Contemporary window handles, electric sockets and light switch to match. 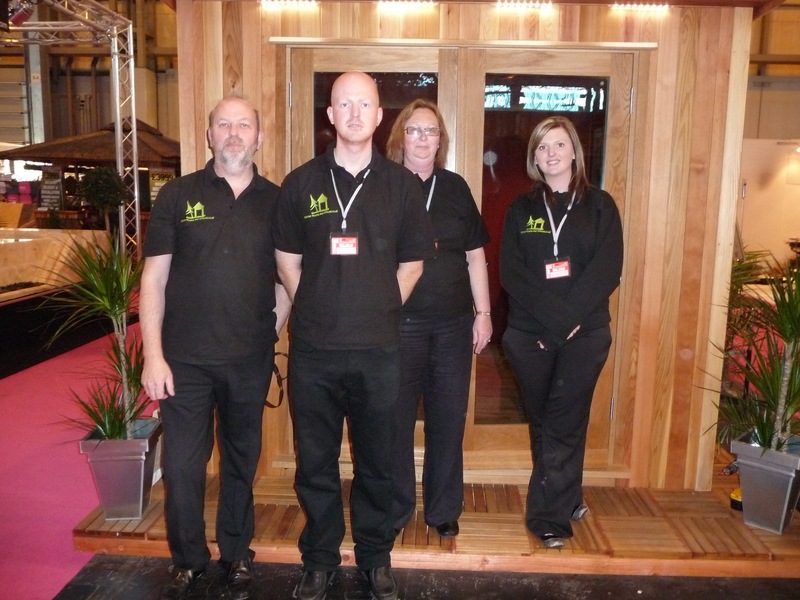 FIT IN SILVERDALE BY OUR STAFF. 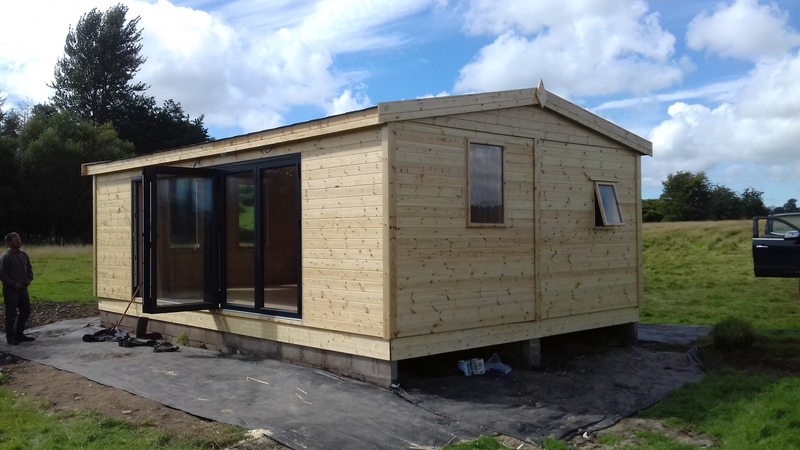 FULLY LINED AND INSULATED WITH PRE FIT SECRET WIRES FOR ELECTRICS, THIS BUILDING HAS 11 DOUBLE GLAZED WINDOWS TO TAKE IN THE MAGNIFICENT VIEWS OF THE SURROUNDINGS. 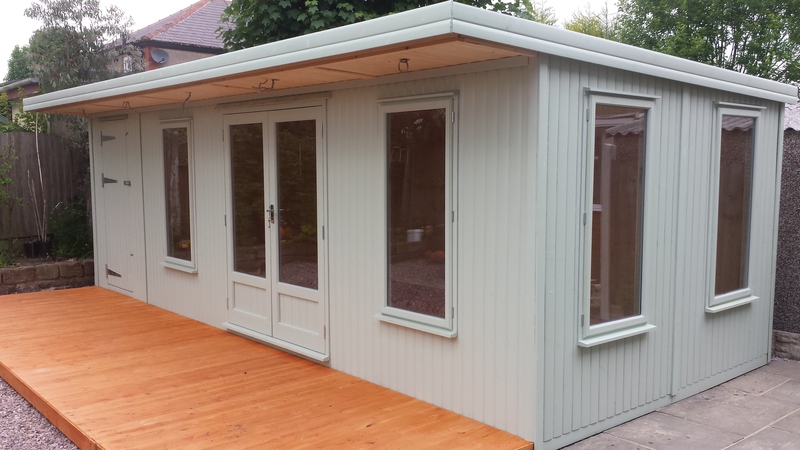 OUR CUSTOMERS CAN NOW SIT OUT IN LUXURY BEHIND A GLASS BALCONY AND HAVE LUNCH !! 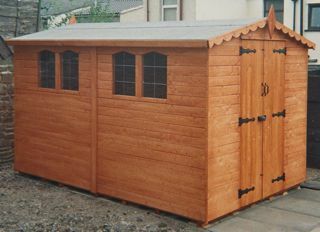 FULLY LINED AND INSULATED FOR ALL YEAR USE. 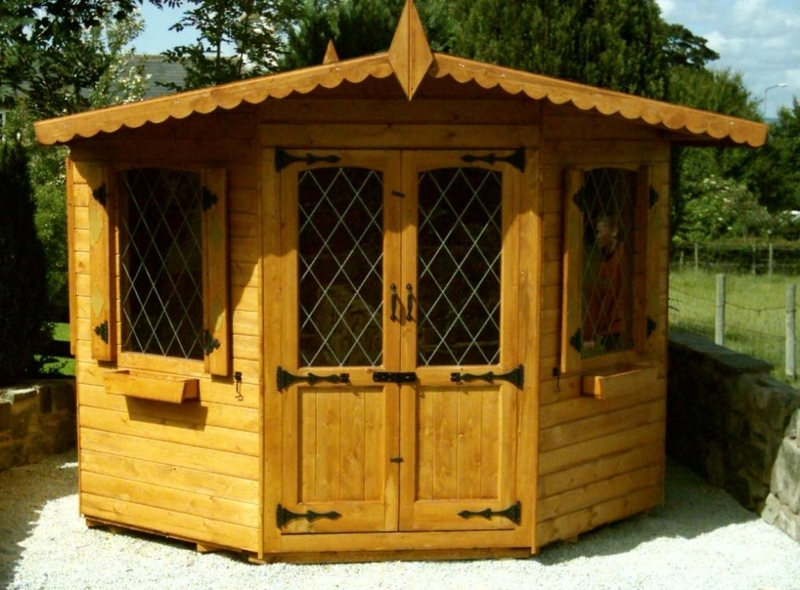 ALL FINISHED OFF WITH ARCS AND SKIRTS JUST LIKE YOUR HOME. 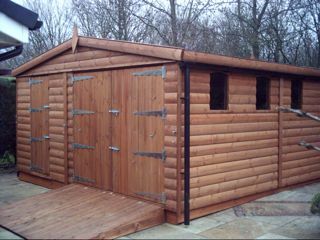 18' X 25' CLUBHOUSE AT DOWSONS ICE CREAM UP DONE AND FINISHED IN ONE DAY PLEASE SEE OUR WORKSHOPS PAGE. 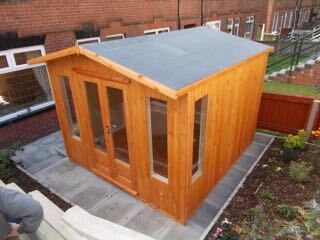 UP DONE AND FINISHED IN ONE DAY !